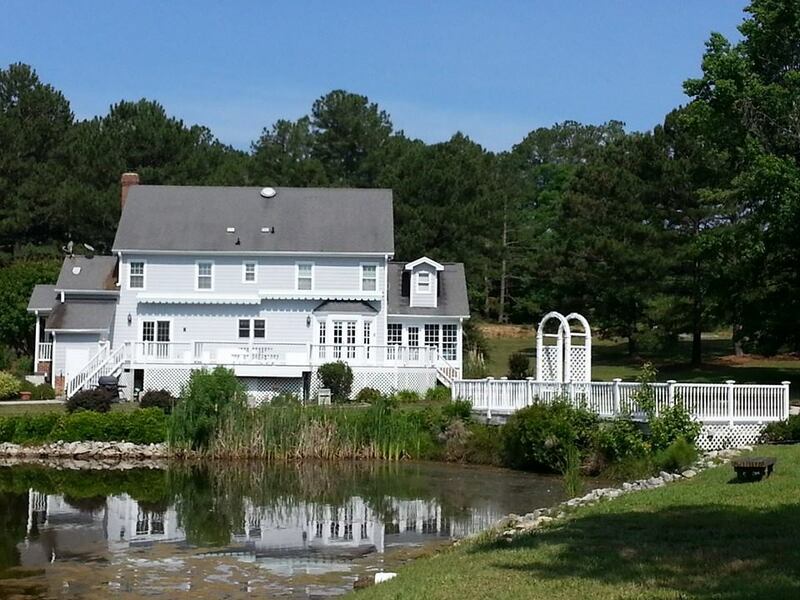 Continuing with this week’s theme of Bed and Breakfast locations, we move to Apex where the B&B Country Garden Inn can offer you everything from a room for the night to a place to hold your wedding! The Inn was opened in 1997 and the “B&B” part of the name stand for Bed and Breakfast, as well as Bud and Beth who own the Inn. Each room is named after a Family member and decorated in a cute vintage style. You can choose from the Violet Room, Rose Room, or the Blue Bonnet room during your stay. Their website has more information regarding the history behind each room name. In the Violet Room, you have the option to rent it out as a suite including the Mickey Room. The Mickey Room is in a Disney theme and perfect if you are traveling with children. The pond in the back, the Gazebo, the Wedding deck and their own Swan make this location perfect for your next event as well! I have helped with their Breakfast with Santa event by having clients bring their children over for pancakes and pictures with Santa himself. Make sure you check out their website for more information and let Bud and Beth know that Mary Kim says hello!!! Posted on July 8, 2014 by marykim1 •	This entry was posted in Bed and Breakfast, Lifestyles of Apex and tagged Apex, Apex NC, B&B, B&B Country Garden Inn, Bed and Breakfast, Bed and Breakfast Apex NC, Cary, Cary NC Real Estate, Events, Fuquay Varina, Gazebo, Holly Springs, Inn, Lake, Lifestyles of Apex, Lifestyles of the Triangle NC, Mary Kim, NC, Pond, Raleigh, Real Estate, Real Estate Agent, Real Estate NC, Swan, Weddings. Bookmark the permalink.